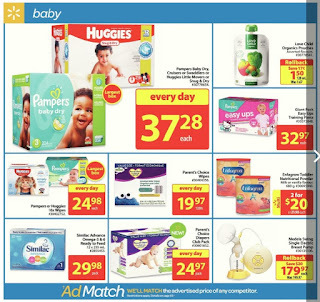 Walmart baby flyer valid August 24 - 30, 2017. Find baby product on sale this week at walmart store, on last page. Also find walmart baby clothes, toddler bed, walmart baby stuff, walmart baby cribs, car seats walmart, walmart baby items and more. Love Child Organics Pouches #:30778541 Regular Price $1.67 - Price $1.50/128 ml $0.17 Savings Assorted flavours. Pampers Or Huggies 16x Wipes #:30402752 - Price $24.98 Largest box. Parent's Choice Wipes #:30404356 - Price $19.97 Scented baby wipes hypoallergenic, vitamin enhanced, soothes, calms, and nourishes skin, enriched with aloe vera. Enfagrow Toddler Nutritional Powder #:30695948 Regular Price $21.98 - Price 2/$20.00 Milk or vanilla flavour. 680 g. Multi. Similac Advance Omega-3 & 6 Ready To Feed #:2855453 - Price $29.98/pack 12 x 235 ml. Medela Swing Single Electric Breast Pump #:30135106 Regular Price $199.97 - Price $179.97 $20.00 Savings Swing is the most technologically advanced and easy to use single breastpump available. Let's Check out what you can buy for best prices Baby product today.